Bently Bearings CTO Drew Devitt takes another look at the Super Critical CO2 Externally Pressurized Porous Gas Bearing Test Core. Drew explains the process of testing and measuring lift on thrust faces with an electronic indicator. To measure lift, weight was placed axially on the spindle assembly while the bearings were fed air pressure. 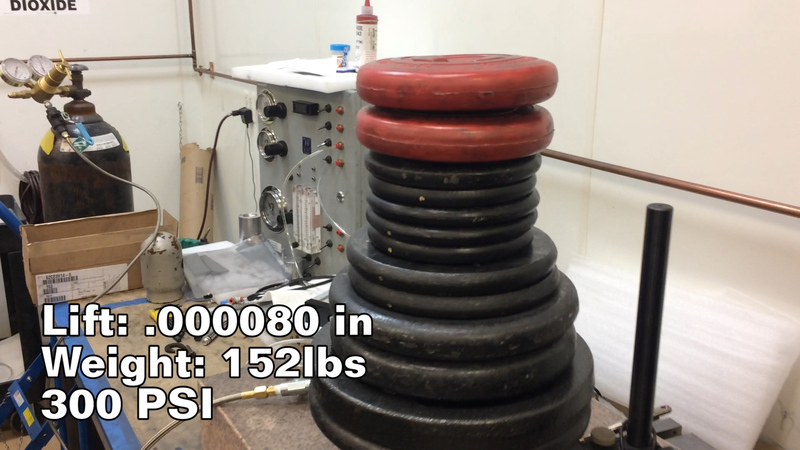 A total of 140 pounds of weight were supported by 1.48 square inches of bearing surface area with 300 PSI of input pressure resulting in approximately 100 PSI of unit loading. Even with 152 pounds, a electronic indicator is still able to measure lift on the thrust faces.